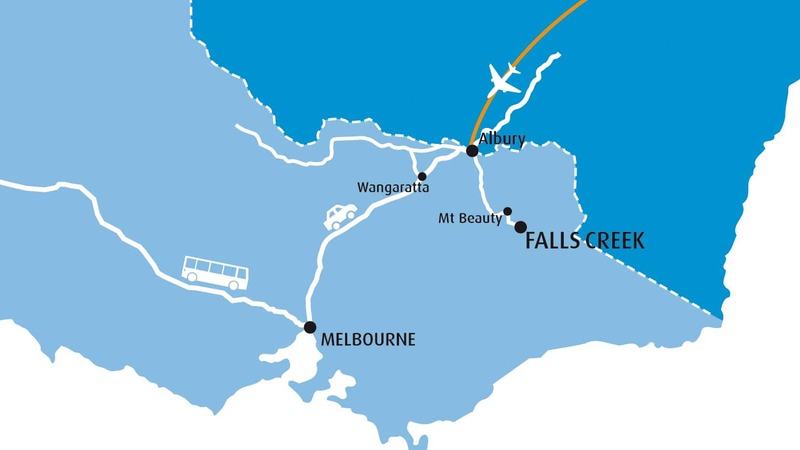 Falls Creek is 4 ½ hours from Melbourne, an easy day’s drive from Sydney and under 2 hours in the car from Albury. There are regular winter bus services from most capital cities, including Brisbane and Adelaide. Most access to Falls Creek is via the nearby township of Mount Beauty and the beautiful Kiewa Valley. Visitors to the Ovens Valley also have excellent access and Falls Creek is just over an hour from Bright. Year round there is excellent fly/drive access - flights to Albury run daily from Melbourne, Sydney, Brisbane and Canberra. With a hire car or bus transfer for the drive leg you can be at the resort less than 3½ hours after boarding your flight. Take advantage of the through road in Summer for access to Omeo, Bairnsdale and beyond (closed in winter). If arriving by car you will need a Resort Entry permit valid for the length of your stay. You only require one permit per vehicle and discounts are available for guests over 65 years old. For coach travel, private transfer and helicopter shuttles the cost of your Resort Entry is factored into the ticket price. Purchase your resort entry online and print out the receipt before leaving home for the cheapest option. During the snow season day car parking is available in The Gully, Slalom and Windy Corner Day Car Park areas. Visitors may self-park in these areas provided they are displaying a valid Resort Entry Permit. Vehicles left in day car park areas overnight risk being issued an infringement. Vehicles staying overnight (or for a number of days) must be parked in specified overnight parking areas. Visitors must drive to the Accommodation Transfer Terminal and look for signage indicating "Overnight Parking Here". Once vehicles are at the overnight parking waiting point, a member of staff will direct youto an available overnight car park. Self-parking is not permitted. For arrivals outside of normal operation (ie 3am), vehicles may be parked in the After-Hours parking area between the Accommodation Transfer Terminal and QT Falls Creek. This area is lit and signed. Visitors must return to their vehicle by 10:30am to move to an appropriate parking area per the above. Visitors 65 and over receive a discount rate on all Resort Entry Permits (including Day, Night and Season Permits). Proof of age is required for this discount so Day and Overnight stays are available to purchase at the resort only (no online sales). There are no restrictions on the ages of other passengers in the vehicle provided one person is aged 65 or over. Discounted Season Permits are able to be purchased online. These will be issued when the owner of the vehicle provides valid proof of age (ie: Drivers License) and proof of ownership of the vehicle (ie: registration renewal form). These documents can be scanned and emailed to [email protected] to speed the application process. Otherwise, present these in person at the Ticket Box, ATS Terminal or Information Centre when you pick up your Permit. 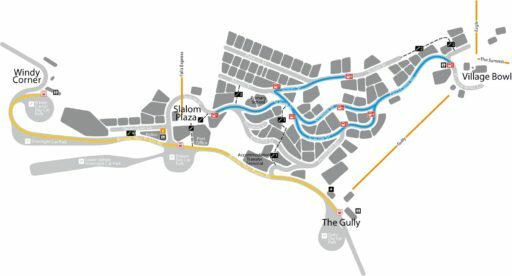 Between June 28 and September 10 the village is closed to vehicles, creating our unique 100% ski-in, ski-out environment. During these times the Accommodation Transfer Service (or ATS) is in operation to transport you and your luggage to and from your accommodation on arrival and departure. 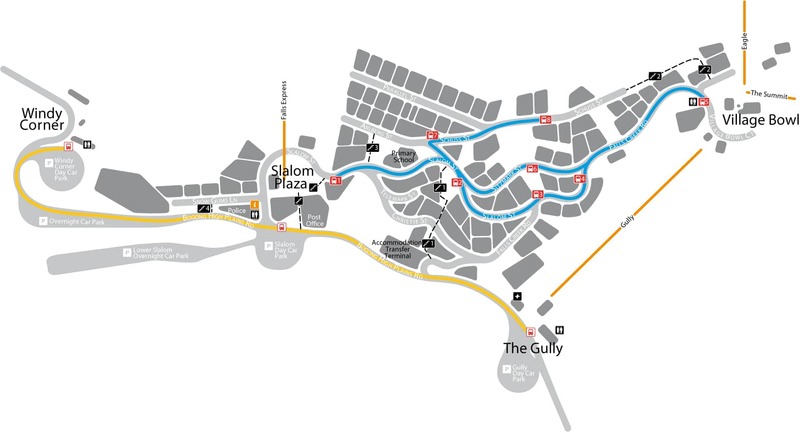 Every day of the declared season dedicated shuttle services operate within the village and along the Bogong High Plains Road. These shuttles are free to use with designated stops for pick up and drop off but no luggage is permitted (skis and snowboards only). In some instances passenger preference may be given to families with young children and the mobility impaired.